“Wilhelm Schüchter was one of those prodigiously talented German conductors who had the misfortune to live in a time filled with geniuses at the podium: Furtwängler, Walter, Abendroth, von Karajan, Krauss, Böhm, Knappertsbusch, Kempe, Schmidt-Isserstedt and Klemperer. In such company, he never had a chance to move into the forefront of his profession outside of Germany. Despite his lack of international success, however, Schüchter managed to leave behind one major recording of LOHENGRIN that deserves to be a part of any serious Wagner collection. Schüchter studied with Hermann Abendroth. He made his début at the podium in Coburg in 1937, conducting CAVELLERIA RUSTICANA and PAGLIACCI. His first major appointment came that same year, as conductor in the opera house in Wurzburg, where he stayed for three years. In 1940, he took an appointed conductor at the opera house in Aachen, a post he held for two years, working under Herbert von Karajan. Two years later, he joined the Berlin State Opera. Following the Allied victory and the reorganization of German cultural life, in 1947 Schüchter joined the North German Radio Orchestra as a conductor and deputy to Hans Schmidt-Isserstedt. His major recording career began soon after, principally for EMI during the late 78 rpm and early LP era. His major activities and his most significant legacy, however, were in the operatic field. 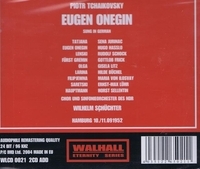 In 1953, Schüchter conducted EMI's first recording of a complete version of Wagner's LOHENGRIN with his North German Radio Orchestra and Rudolf Schock in the title role, Gottlob Frick as King Henry, Maud Cunitz as Elsa, and Josef Metternich as Friedrich. This performance remains one of the most finely crafted recordings of the opera ever laid down and is competitive with all subsequent stereo and digital recordings. The singing has a warmth and power that resounds more than 40 years later and the playing is extraordinary, a match for any orchestra in the world. Moreover, the sound -- despite being limited to mono -- is extraordinary for its era, being both rich and close. Unfortunately, Schüchter never got to record another complete opera, eclipsed as he was outside of Germany by figures such as Karajan and Klemperer. His career in the concert hall was more successful; in 1958, he took a three-year appointment as the chief conductor of the NHK Symphony Orchestra in Tokyo, and after his return to Germany in 1962, he was made music director of Dortmund. It was in this post, in just three years, that Schüchter achieved fame in Germany, raising the musical standards in Dortmund so high that he was promoted in 1965 to artistic director and general manager of the Dortmund State Opera. He remained in this position for the rest of his life and was acclaimed for the excellence of the productions mounted by the company and its overall rise to prominence within Germany. His Wagnerian performances in particular were singled out for praise by critics.